Daily Illuminator: Andrew Plays Chez Geek! 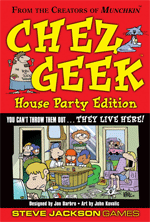 January 17, 2013: Andrew Plays Chez Geek! But I've never played on camera, and never against Internet nerd luminaries Wil Wheaton and Paul & Storm. The most important question: did I win? You'll have to watch to find out!